So, mental preparation has been the single biggest element of IDF training leading up to the government's Aug. 15 disengagement deadline. Part of that effort has been role-playing daylong simulations. Last week, each Ofek soldier assumed a settler alter ego, down to political views and personal habits. They donned the orange ribbons of the anti-disengagement movement and shrieked anti-disengagement chants at other units practicing their eviction protocol. "You are a traitor to your people!" screamed one through a bullhorn, as his comrades laughed nervously. This week, the roles were reversed. 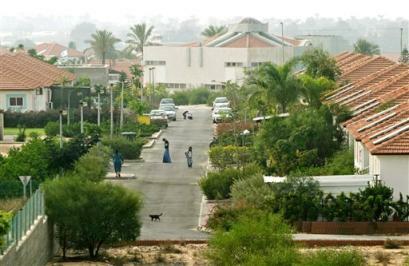 On a kibbutz three minutes from Gaza, a team from the unit practiced removing the same family from a home over and over. Sometimes they carried out family members, each soldier assigned an arm and a leg. Sometimes they waited for hours in the blazing sun as the "family" shouted insults at them from inside the home. "Traitors!" yelled a voice from inside the house. "Police state!" screeched another. Did Ofek's earlier experience as "settlers" give them any tools to help deal with the verbal assault? "You can't listen to what they say anyway," said Amit, a young soldier from central Israel, as the "negotiations" continued. "I'd be mad too. We've come to take them from their home. Of course we're not welcome." Many of them live there because they -- or their parents, or even grandparents -- were asked to live there, by the Israeli government, in the belief that Israel would have peace with the Arabs only if the Arab nations realized they had something to lose. Naturally, these "settlers" are upset at this reversal of positions, which will force them to uproot their homes and families. Earlier this month, army psychologists and brigade commanders coaxed soldiers into confronting their worst fears for disengagement. "What would make you freeze?" asked an officer at one session. The young soldiers eyed each other nervously before responding. The most common answers weren't the stuff of typical battlefield nightmares: A familiar face. A wheelchair-bound grandmother. One nervous woman stood and spoke softly. "I worry about a crying child," she said hesitantly, playing with the hair at the back of her neck. To carry off obstructing settlers, the unit has been broken into teams of four, by gender and size; female soldiers have been instructed to handle resisting children if their parents won't. "I don't want to separate a mother from her child. I don't know how I would handle that. I don't want to think about that." Please note that the IDF commanders are struggling with a difficult situation too -- and they're helping rank-and-file soldiers to cope with it all. Please read the whole thing... and please think about this, next time you read about the Israeli evacuation of Gaza and think Israeli soldiers are inhuman monsters. Please remember, also, that the forcible transfer of a population from one region to another -- as we see here -- is one that Israel has consistently refused to do with respect to Palestinians. Israel, frequently accused of barbaric treatment vis-a-vis the Palestinians, is thus being gentler and kinder to them than to Israel's own citizens. In the process, Israel is also giving the Palestinians a good part of what they claim they want -- land to do with as they will, unhindered by the troublesome presence of Jewish neighbors.